Naas defeated Moorefield by a point in an entertaining game in Naas. In a low scoring game due mainly to the performance of the two goalkeepers Barry Reynolds(Naas) and TomCorley(Moorefield) Naas led through-out to hold on by a point. In the first half the scores were fairly even but a thirtieth minute point from Eamonn Callaghan gave Naas a 0 – 5 to 0 – 4 interval lead. Naas got on top in the second half and led 0 – 10 to 0 – 6 after twenty minutes. 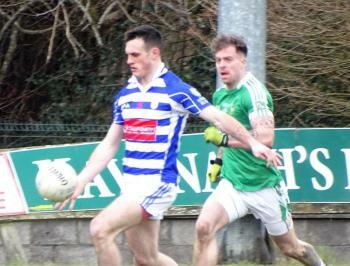 A Moorefield fight back saw them score three points in the last five minutes but time ran out on them and Naas held on. In the opening half Naas were first on the scoreboard with a Ronan Joyce point. A Murray free equalised for Moorefield. Naas took the lead after twelve minutes when Ailin McDermott ran through the Moorefield defence for a well taken score. Naas went two up after Fifteen minutes with a point from Dallan Gallagher. The teams swapped points before two Murray frees brought the sides level at 0 – 4 each. On the stroke of half time Eamonn Callaghan ahead at half-time. Naas led 0 – 5 to 0 – 4. Naas opened the scoring again in the second half but Moorefield drew level again with points from Aaron Masterson and Roly Sweeney. Four unanswered Naas points from Ronan Joyce,Ciaran Doyle and two from Eamonn Callaghan between the tenth and eighteen minute put Naas four up at 0 – 10 to 0 – 6. Three Murray points in the last five minutes reduced the arrears to one point but they failed to get the equaliser. Scorers: Naas: Ronan Joyce(0 – 4), Eamonn Callaghan(0 – 3), Ailin Mc Dermott, Dallan Gallagher and Ciaran Doyle(0 – 1 each). Naas: Barry Reynolds, John Hill, Shane Bergin, Paul Sullivan, Eoin Doyle, Eoghan Bateman, Ailin McDermott, Paul McDermott, Brian Kane, Eamonn Callaghan, Brian Byrne, Dallan Gallagher, Ronan Joyce, Ross Kelly, Ciaran Doyle. Moorefield: Tom Corley, Liam Callaghan, Liam Healy, Mark Dempsey, Daire Dunne, James Murray, Sean Healy, Aaron Masterson, David Whyte, Kevin Murnaghan, Eoin O’Connor, Ian Meehan, Eamonn Callaghan, Mark Murray, Mark McDermott. Thanks to Liam McManus for the photos & the report.